Rajasthan became first state in the country to incorporate skill development programme in higher education. With respect to the same, Indira Gandhi National Open University (IGNOU) in collaboration with state’s Department of College Education has prepared 16 courses for entrepreneurship and skill development for colleges in the state. According to the 2017 Nations Brands Report prepared by Brand Finance, India was ranked 8th out of 100 countries on a list of most valuable nation brands. India slipped by one rank from last year’s 7th by ceding its position to Canada. United State of America topped this year’s list. For the first time, National Disaster Response Force (NDRF) organised BIMSTEC Disaster Management Exercise-2017 (DMEx-2017) was held in New Delhi, India from October 10-13, 2017. The mandate of exercise was to provide platform for sharing best practices on all aspects of Disaster Risk Reduction (DRR), strengthening regional response and coordination for Disaster Management among BIMSTEC (Bay of Bengal Initiative for Multi-Sectoral Technical and Economic Cooperation) member countries. 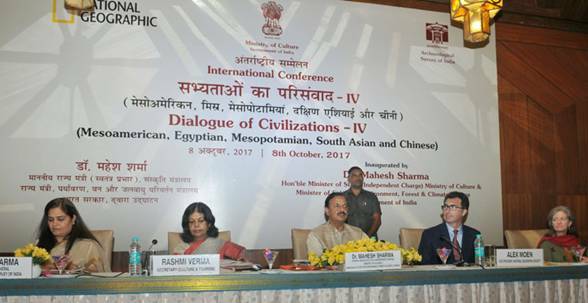 The International conference on “Dialogue of Civilizations – IV” w as recently held in host nation India. The conference organised by Archaeological Survey of India ASI), under Union Ministry of Culture in collaboration with National Geographic Society (NGS) was inaugurated in Delhi. The purpose of conference is to encourage scholarly and public discourse about five ancient, literate civilizations of the world, i.e. South Asia, Egypt, Mesopotamia, China and Mesoamerica. Jagdish Mukhi was sworn in as new Governor of Assam succeeding Banwarilal Purohit who has been appointed as the Governor of Tamil Nadu. Ajit Singh, Guahati High Court Chief Justice administered Oath of Office to him. The Ministry of Road Transport and Highways (MoRTH) has decided to implement “Value Engineering Program” to promote use of new technologies, materials and equipment in highways projects executed either under Public Private Partnership (PPP) mode or public funding mode. The Union Government imposed anti-dumping duty on imports of certain steel wire rods from China for five years to guard interest of domestic players from cheap in-bound shipments. In its findings, Director General of Anti-Dumping & Allied Duties concluded that ‘wire rod of alloy or non-alloy steel’ exported from China to India is below normal value due to which domestic industry was suffering.